volcanic ash - Solar System Planets And Moons Section. Spacecraft Designer Maxime Faget Passes Away. Dr. Maxime Faget, one of the most prolific of NASA's spacecraft designers, passed away on Saturday at the age of 83. Faget contributed to designs to every single NASA spacecraft, from the Mercury capsule to the space shuttle. He started working with for the US space effort in 1946, when he joined the staff of the Langley Research Center as a research scientist. He was later selected as one of the original 35 designers for the Mercury project. Faget retired from NASA in 1981, and went on to work for a private space firm called Space Industries Inc.
Worldwide Pollution Levels Seen From Space. After 18 months of observations by the Envisat Earth monitoring satellite, the European Space Agency has produced a detailed image of the entire Earth that shows nitrogen dioxide pollution. Nitrogen dioxide is generally a man-made gas - produced in power plants, heavy industry, and burning - which can cause lung disease and respiratory problems. Previous maps like this have been made, but this image is at a resolution of 60 x 30 km (37 x 19 miles), so scientist can pick out individual cities which are a source of pollution. 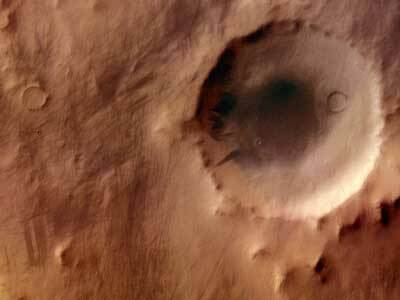 This image of a Martian landscape was taken by the European Space Agency's Mars Express spacecraft in May 2004. It shows an area in the Promethei Terra region, which is relatively smooth, but covered with a layer of dust or volcanic ash several tens of metres thick. This layer has covered everything, and obscures fine details; that's why the picture looks a little fuzzy. The crisscrossing lines across the picture are the tracks left by dust devils.